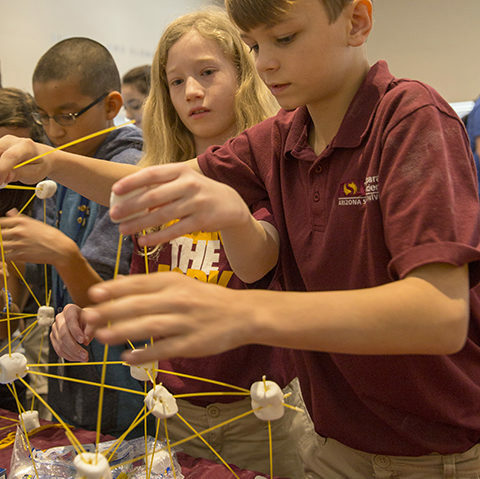 More than 1,000 elementary and middle school students gathered at ASU’s Polytechnic campus to discover engineering at DiscoverE Day hosted by the Fulton Schools of Engineering. 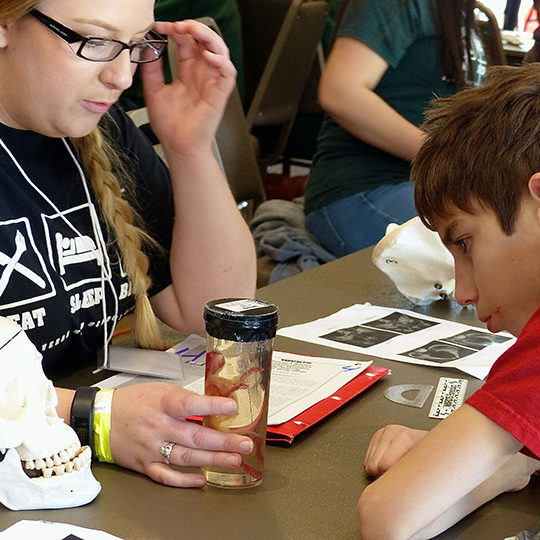 Volunteers from a variety of ASU clubs and programs led the students through hands-on experiences. 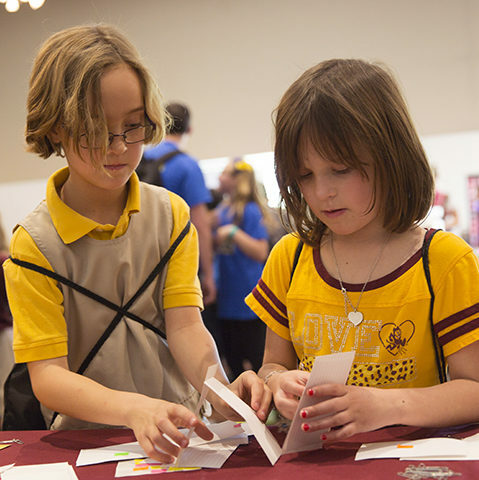 A pair of future Sun Devils practice their building skills while trying to construct a house of cards. The activity was hosted by the Community Mentors from University Housing. Can you pop the balloon? 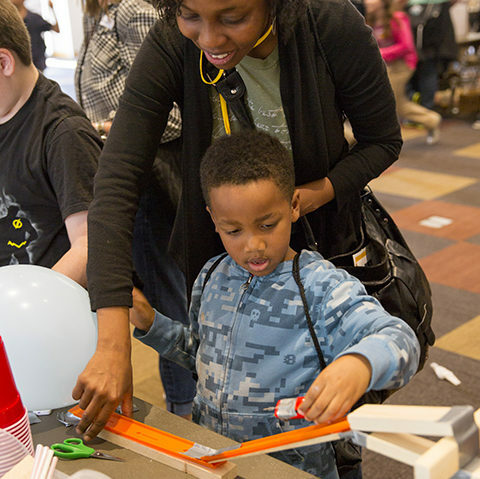 A young student and his mom try to build a chain reaction machine and pop a balloon. 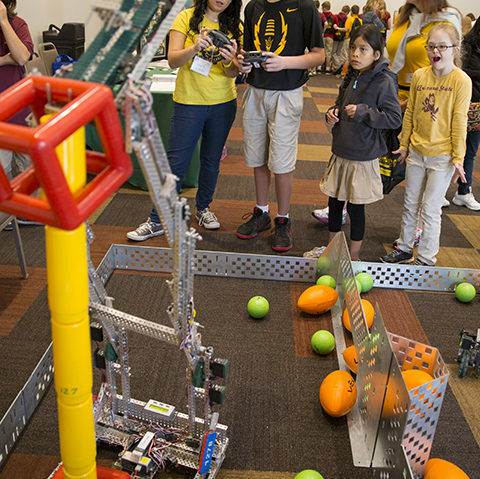 The Sun Devil Robotics Club wowed DiscoverE day visitors with a collection of quadcopters and robots of various styles. Will it float? Students stop by the Global Resolve table and attempt to build a boat using straws, duct tape and plastic wrap. Builders attempted to see how much weight their creative craft could handle before sinking. Students use a little teamwork to build the best tower out of marshmallows and spaghetti noodles. Students had to consider multiple factors in determining the best design. Mitch Armstrong (right) helps a students' creation move down the track. 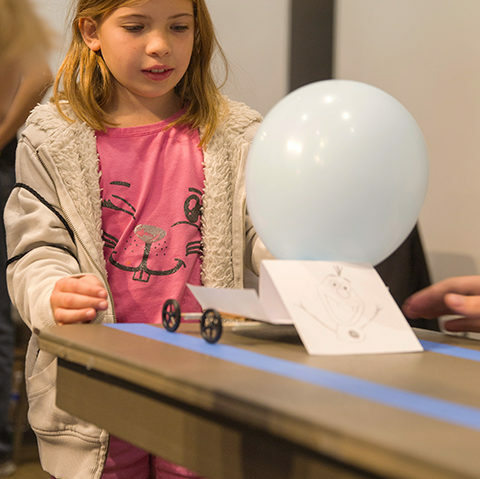 Armstrong and other volunteers helped the students craft balloon and rubber band powered vehicles that could move independently over a specific distance. 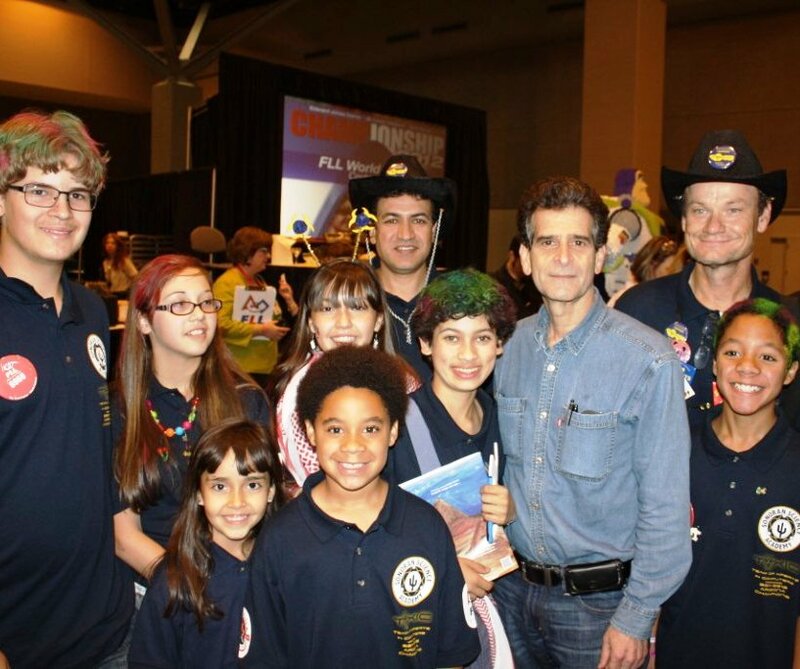 Do you want to build a rubber band car? 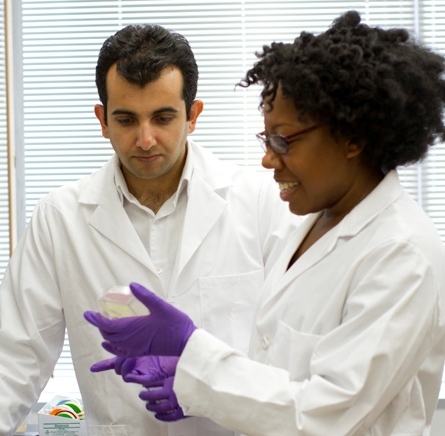 A young student tests her creation. Her vehicle was able to move more than three feet down the track without assistance. 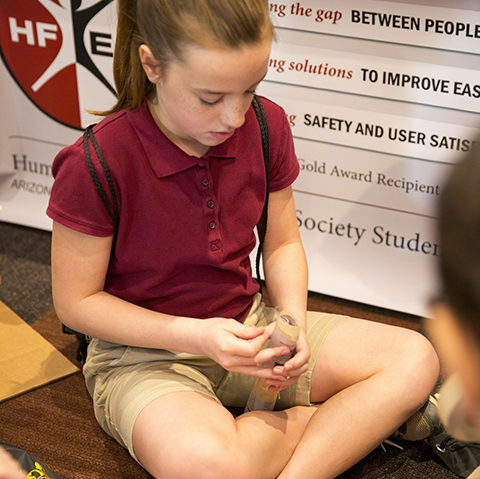 The Human Factors and Ergonomics Society, student chapter, gave students a chance to build on their knowledge of engineering. They had to build a table out of paper that could hold a package of construction paper. 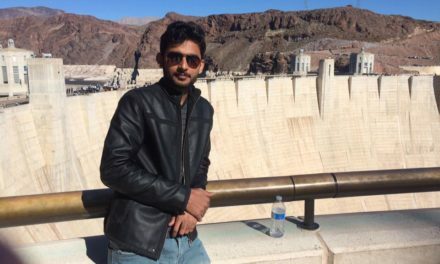 This student tries a model with cylindrical legs. 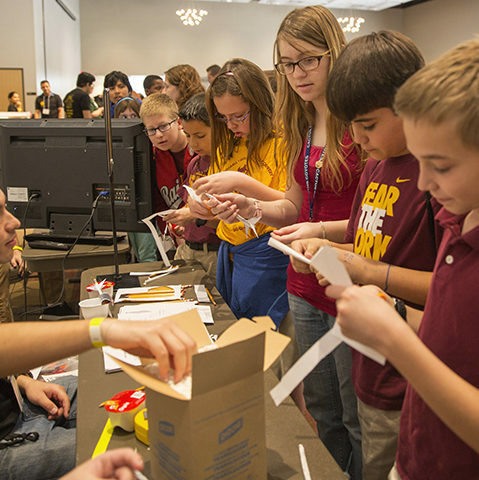 Volunteers from the American Helicopter Society hosted an activity for students to build working rockets. Fear not, the rockets did fly, but were made of straws and paper and not explosive rocket fuel. Some models went 5 to 10 feet in the air. 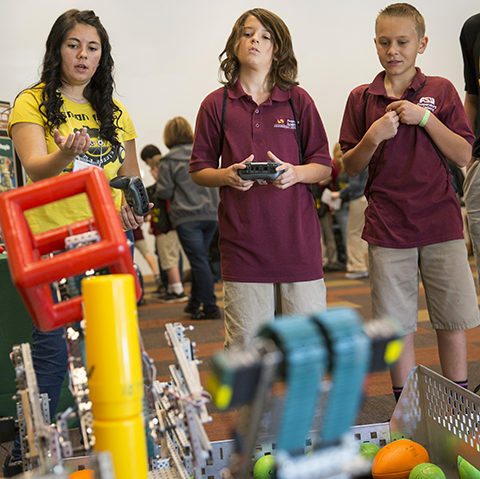 The Vex Robotics Club gave students a chance to drive a robot. Students had to maneuver the robot while trying to perform a specific task. These students at the Vex Robotics booth learn that making a robot drop an object on a post is harder than it may seem. Andre Hammonds from On Track Academy gets a lesson in skeletons from Cheyenne Spaur from Campo Verde High. 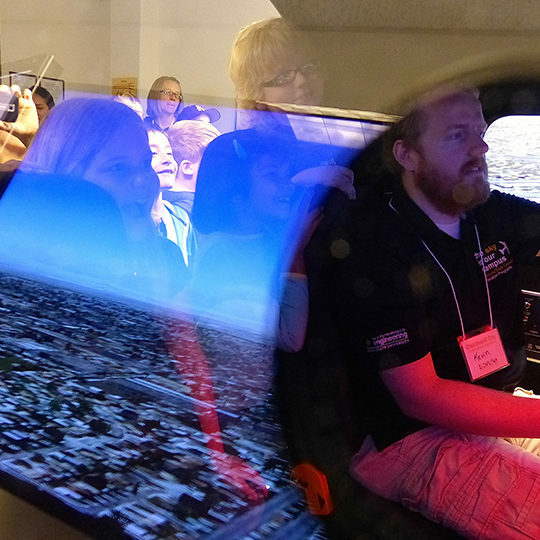 Aviation student Kevin Taylor shows the kids how to fly a plane as he demonstrates the King Air simulator. Boys will be boys when it comes to chucking melons. 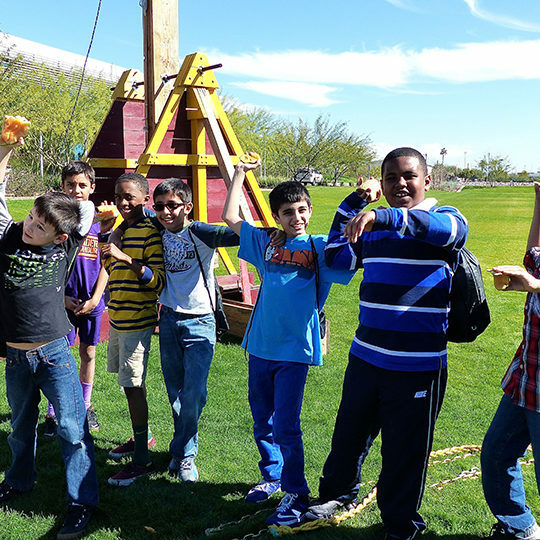 Students from New Vista Center for Education show what their arms are made of. 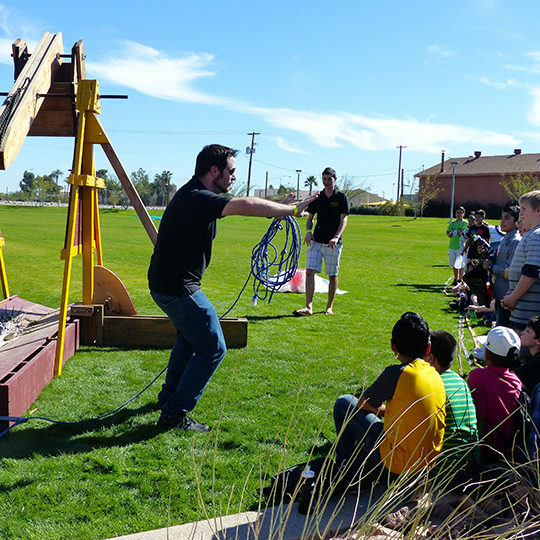 Industrial engineering student Jonathan Topliff describes to students how the trebuchet works. It is not a catapult, by the way. 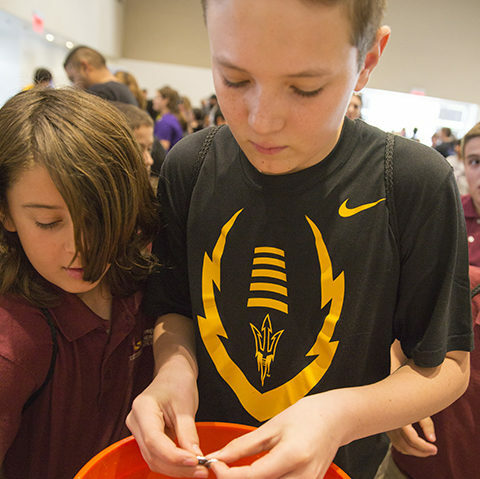 ASU’s Ira A. Fulton Schools of Engineering welcomed young students and their teachers at ASU’s Polytechnic campus to learn about new healthcare devices, how buildings are built, how solar energy works and much more at our fourth annual open house event, DiscoverE Day at Polytechnic campus on Friday, February 6, 2015. 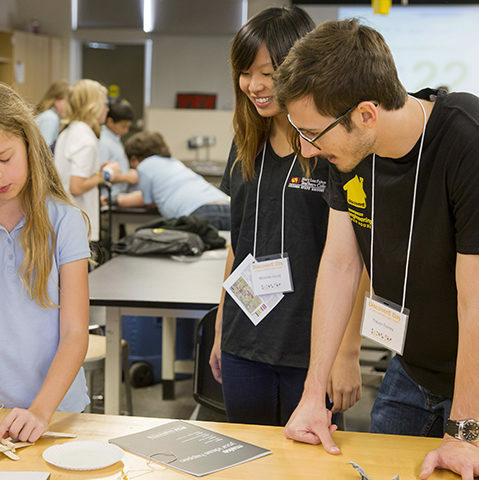 On Friday, March 27, 2015, we will welcome more students from third grade through high school from around the Phoenix metropolitan area to discover engineering and technology at the Tempe campus. 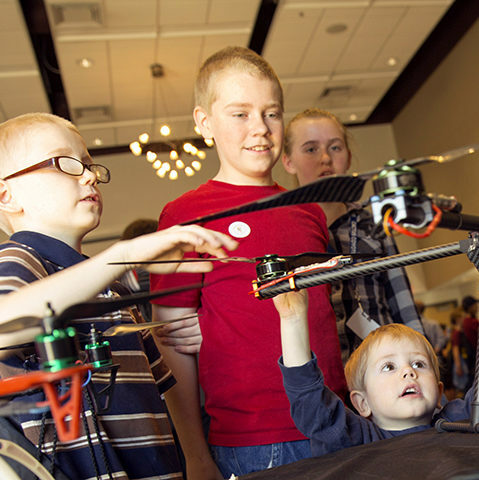 The Engineering Open House is part of a broad, community-wide celebration of science and engineering. 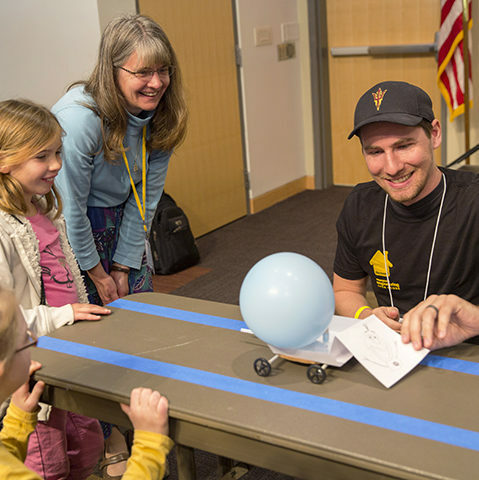 Other events you might enjoy are held throughout February and March during the Arizona SciTech Fest, a state-wide celebration of science, technology, engineering and math (STEM or STEAM when you include the arts).